Dust never settles at Martin Patrick 3, the North Loop men's store dubbed "as good as bricks and mortar can be" by Minneapolis retail branding expert Tina Wilcox. After opening a bedding boutique with exclusive designs by Colette Jaffe last month, a men's barber shop called Marty's by Jon Charles has just been added. It takes the place of Apology, the women's gift department which has been temporarily downsized to a smaller area. 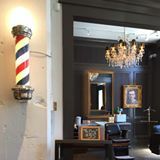 The three-chair barber shop (with barber pole) for men and boys fits like a glove inside the handsome, classically modern men's store. A handful of services are offered so far--a Marty haircut (a quick, no shampoo cut) for $35, a Maxx cut with shampoo and styling for $45 a kids cut for $25, gray reduction color and a neck shave. Women can get their hair cut too, said co-owner Dana Swindler if they want a more masculine cut. ""It makes sense to offer a barbershop to their clients," said Wilcox. "It's part of the total circle of guys who want to look good. A lot of Minneapolis executives shop there who are time-stretched." North Loop continues to attract a desirable tenant mix. Besides recent additions of Grethen House, InVision Eyewear and Pacifier, The Hewing boutique hotel with 125 rooms opens at the end of October at Washington and 3rd Aves. North. Russell + Hazel stationery will open at the end of the summer. "Martin Patrick is spectacular in a town where luxury doesn't always work," said Wilcox. "They do so many things right."